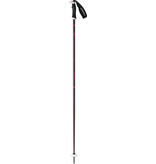 The Atomic AMT² SQS W ski pole is the perfect complement to our range of women’s all-mountain skis. It’s got a lightweight aluminum construction and stylish design. It’s also got a comfortable AMT Grip that will fit female hands perfectly, plus an AMT Strap and a 60mm AMT Round Basket. Ready to hit the piste or powder whenever you are.